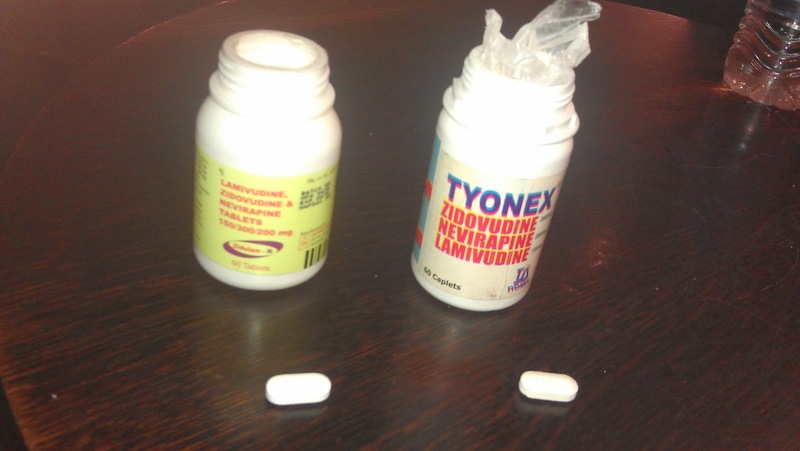 Just over a month ago, I wrote about the issue of sub-standard anti-retro viral drugs (ARVs) in Nigeria, and when some of my friends contacted people who were supposed to be in the know about the management and distribution of ARVs in Nigeria, they appeared to pooh-pooh the idea. The message coming back was that the complainers were not interested in using drugs manufactured in Nigeria, that they wanted foreign-sourced drugs. 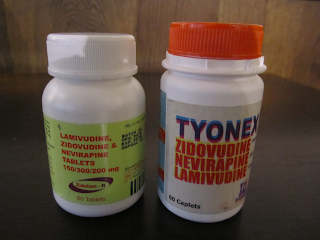 Well, this afternoon, I handled with my own hands the drugs, a bottle from India and Nigeria of the same formulary of ARVs (Zidovudine [AZT] 300mg, Nevirapine 200mg, Lamivudine [3TC] 150mg), but that is where the similarity ends. 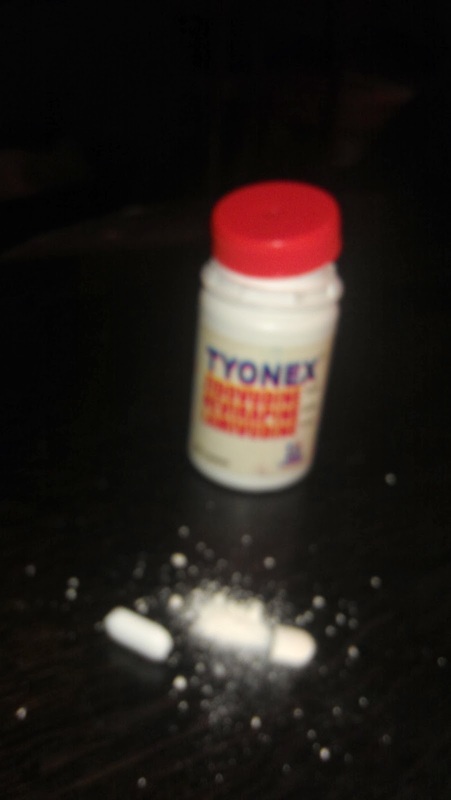 It is important that we clarify that the drugs are not fake, they are sub-standard, and I would illustrate what I mean with pictures to follow. 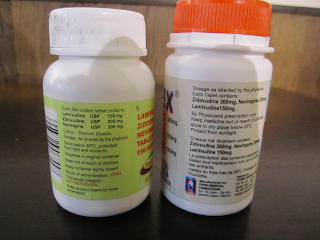 The Indian manufactured bottle is on the left, the Nigerian manufactured bottle is on the right, and the first thing that you see is the poor quality of the labelling. 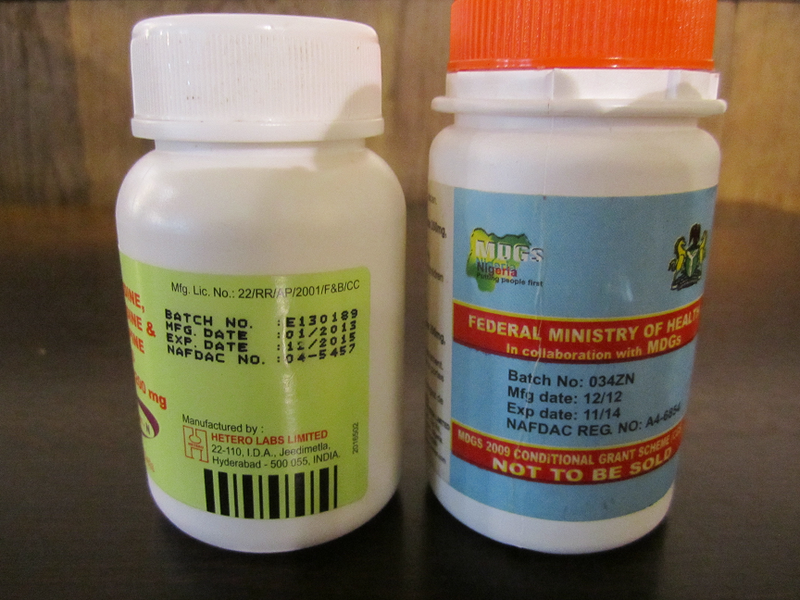 By comparison the shelf-life of the drugs is 35 months for the Indian version and 23 months for the Nigerian version – A first indication of a difference in quality or standards. The problem seems to come down to information on this part of the bottle label. The Indian version is to be stored below 30°C and protected from light and moisture, the Nigerian version should be stored in a dry place below 25°C and protected from sunlight. Besides this, whilst Nigeria does not have as much rain as the monsoons of India, the rainfall is spread across more months suggesting the climate in Nigeria is broadly humid resulting in more months of precipitation. 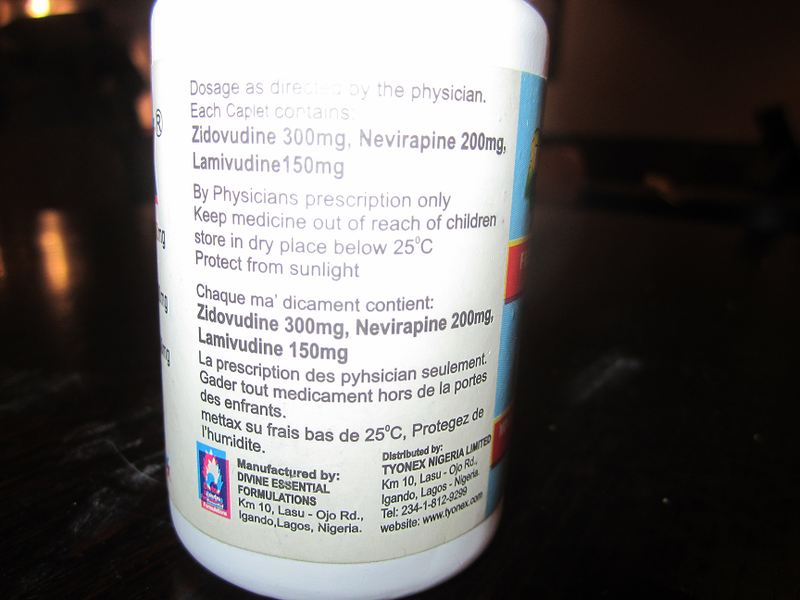 It goes without saying from this basic observation that the instructions on the bottle of the Nigerian manufacture ARVs must at least be the same as the ones for India – Store at below 30°C, in dry place, protected from light and moisture. It is also interesting to note the difference been the English and the French instructions on the Nigerian bottle. Apart from the typographical errors where the obvious one is physician spelt as pyhsician, why Anglophones should be concerned about sunlight and the Francophones are more affected by humidity, escapes me. A French-speaking observer of this said, “It is full of typos, and badly translated from English.” In other words, this is patently shoddy work and that is just the labels on bottles on life-saving medication. La prescription des pyhsician seulement. Gader tout medicament hors de la portes des enfants. Mettax su frais bas de 25°C. Protegez de l'humidite. It is just about understandable. - Mettax misspelled = mettre (keep/store) but should be "conserver"
All the accents are missing and overall it say on prescription only, keep away from children store below 25°C, protect from humidity. It does not make any reference to sunlight. Why Tyonex could not get a French speaker in Nigeria to properly translate the English portion of the label to French escapes me. I am sure Google Translate would have done a better job. It is unprofessional, shoddy and really dampening in confidence. Opening the bottles, the quality becomes evident, the Indian version has a desiccant, the Nigerian version does not, the tablets or caplets as the label indicates are in a cling film bag all coated with the white dusty powder of the pills. The Indian version remains intact to the touch whilst the Nigerian version leaves a chalky residue on the fingers when touched and when held firmly between the thumb and a finger, it disintegrates as seen below. It goes without saying that poor manufacturing standards without consideration for the socio-economic and climate conditions in which the drugs would be used can inform the rapid deterioration of the medications leading to sub-par efficaciousness of the medicines, the consequences which can be dire and life-threatening to patients who need these drugs to survive. Even if the drugs were to be kept in a fridge, the power situation in Nigeria precludes that, it only means that standards should be significantly raised to improve the quality of these drugs, and one cannot say what other drugs are poorly packaged and distributed as these. 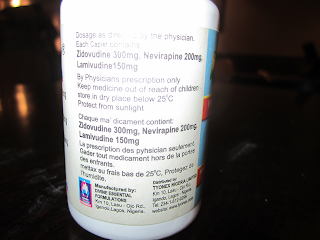 The label also has a NAFDAC Reg. No: A4-6854, which begs the question of what standards of inspection and quality that organisation imposes on drug manufacturing companies to ensure the general public are not put at risk. There is every reason to believe that the manufacture of short shelf-life, poorly labelled, badly packaged and low integrity ARVs means corners have been cut in the system, somewhere between the bureaucracy and the businessmen who are probably paid to do a better job than this. It is the duty of everyone to ensure that the chain from sourcing of formulation through dispensing to the patient ingesting the drugs is maintained to the highest standard of manufacture and integrity for us to be confident that drugs meant to save lives are not placebo effect dummies with no efficacious value. I also hope everyone involved including activists ensure that they are compromised and bought off by the system where the lives of ordinary people are impacted. When I was contacted about this issue last month, the person had suffered a precipitous fall in their CD4 count to 25% of what it was 6 months before. That is just unacceptable, and it indicates a sense of urgency and an emergency that needs to be addressed with immediate alacrity. 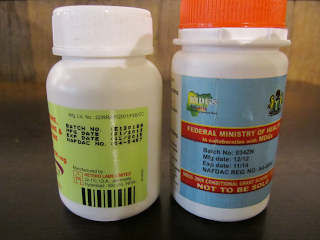 There were no other indications in the bloods that could account for that result apart from the Nigerian manufactured ARVs, and it would appear more of the Indian manufactured ARVs are now being distributed in Nigeria.